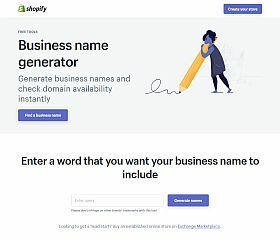 Created by Shopify, this domain name generators relies on a keyword input to generate thousands of available .com domain names. Extremely simple to use, the design and layout of the generated names makes reading (and finding) the perfect name easier than ever. Acquired by Automattic (the people behind WordPress), this robust tool allows you to input a keyword and have thousands of .com domain names generated for you. Additionally, it allows you to easily toggle between your keyword placement at the beginning or the end of the list of generated domains. NameMesh is a very robust and in-depth tool that allows you to find lists of available domains via their multiple tools built into their search functionality. It creates a variety of lists for you to choose from, including: Mix (a combination of popular suffixes), Fun (for brandable, misspellings, etc. 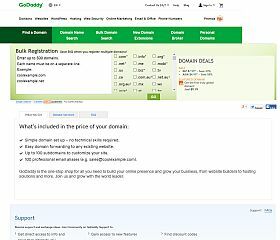 ), other popular top level domain extensions, new top level domain extension check, thesaurus check, common combinations, and more. 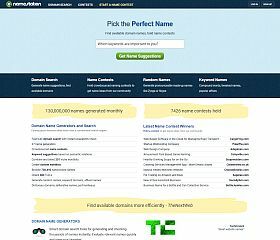 NameStation offers dozens of tools and generators designed to help you find the perfect domain name. In addition to the tools, the site also offers naming contests – where you can pay to have a group of people generate names for you based upon your topic and/or keywords. This tool also offers a premium version which allows unlimited searches and enhanced functionality – making it worthwhile if you’re looking for an important name for a business, website, or blog. 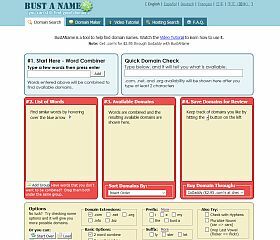 One of the best tools for combining keywords to generate domains, Bust A Name allows you to group keywords, check five different extensions, check names with prefixes and suffixes, pluralize your keywords, drop the last vowel from your keywords, check hyphenated names, and more. 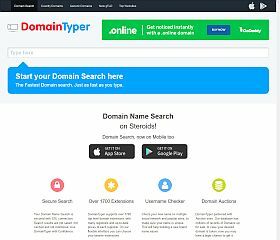 Also on the site you will find the “Domain Maker” – which generates creative and natural-sounding (available) names based upon your keyword (as well as expanding your keyword to include various related words and ideas). Prepend, append, and generate unique names with this clean and well-designed naming tool. 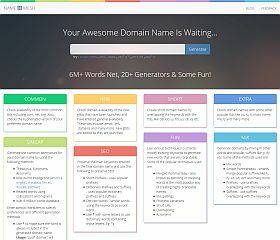 Add adjectives, verbs, and nouns (by 4, 5, or 6) letters to the front or end of a keyword with this domain name generator that will combine its own internal list of keywords to create available .com names. Very useful for lists of name ideas that you might have generated with other tools, check the availability of names in bulk (as well as nearly every extension) with this easy-to-use tool. 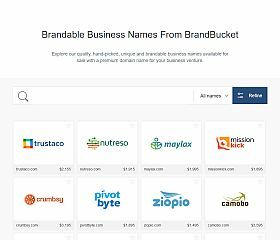 If you’re having a tough time coming up with your own name and have a little budget to work with, BrandBucket offers hundreds of creative and unique domain names that you can purchase through their site (or serve as inspiration). For those who have a difficult time with naming, this site makes a great alternative to coming up with your own. Finding a good, usable, and catchy domain name is (for me anyway) is one of the biggest headaches of starting up a new business or project. The days of simple dictionary-word .com domain names is behind us, however, the opening up of new extensions (and the adoption of them by users) has also opened up new possibilities and opportunities for naming. Many startups and websites now use .co and .io has quickly been gaining in popularity, fortunately making a domain name with a .com no longer as integral a component for success. Hopefully, these tools will help you find the perfect name – or at least get you started on your way toward finding one.